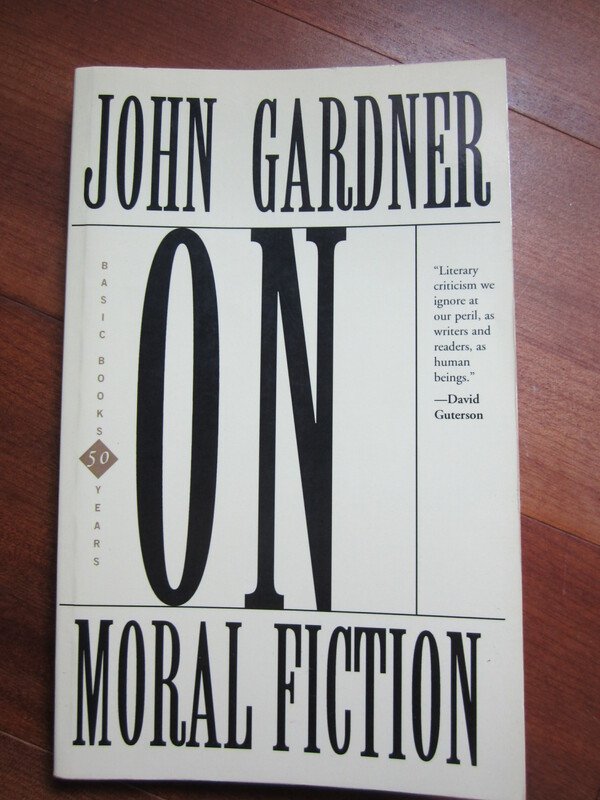 As a man who labored for years at his craft, received constant rejection slips from publishing houses and editors, worked as a university professor to sustain a living, and struggled to maintain his sanity and his way of life as a writer, John Gardner embodied the very essence of what it means to be a true writer, both unpublished and published. After working seven days a week for years developing and perfecting three novels, being rejected by several well-known editors of the time (one being Bob Gottlieb of Knopf), Gardner, in a leather motorcycle jacket, must have finally had enough when he drove to David Segal’s office at New American Library with three finished manuscripts in a shopping bag and tossed them on the editor’s desk and said, “I’d like you to read these novels… Now” (On Becoming a Novelist, p 106). Despite Gardner using an unorthodox approach, for then and now, Segal would later accept and publish all three novels. The Art of Fiction, one of several dozen books published by Gardner, would be labored over and used for years for Gardner’s own creative writing students before it would be published posthumously in 1984, two years after his deadly motorcycle accident. What The Art of Fiction does do is to place a firm understanding upon a slippery subject known as writing and art; Gardner, however, writes with such authority and sincere honesty that his recommendations, advice, laws remain, even now, unquestionably resolute. In The Art of Fiction’s preface, Gardner writes: “About all that is required is that the would-be writer understand clearly what it is that he wants to become and what he must do to become it” (p ix). No easy task. 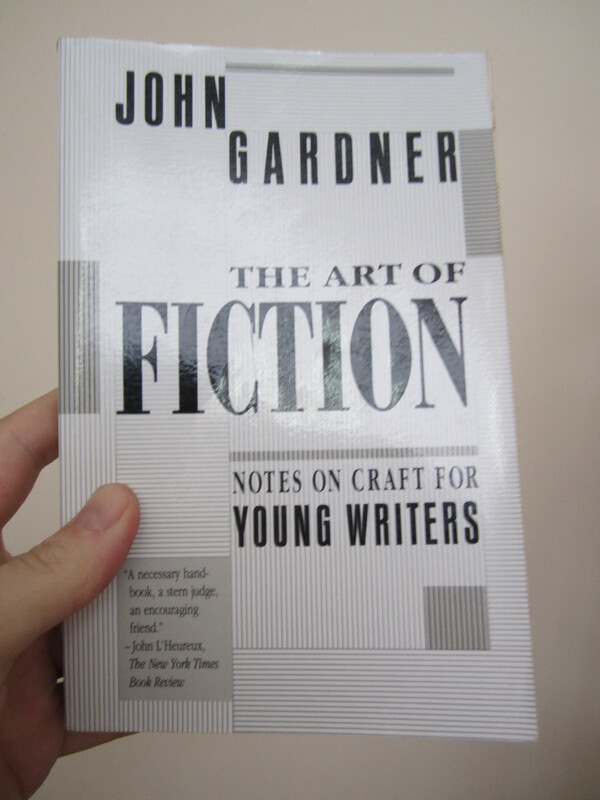 But Gardner continues for two hundred pages describing exactly what a would-be writer must know in order to begin to make conscious decisions about the craft of writing. First, in “Aesthetic Law and Artistic Mystery” Gardner firmly and quite clearly informs the would-be writer that Art depends on three things: “feeling, intuition, taste” (The Art of Fiction, p 7). Over the years, a solid decade of sweating and pouring over hundreds of pages of my writing while also receiving those informal and cold rejection letters from agents, editors and publishers, I have had to learn (the hard way: without a single peer reader before my MFA) how to trust my writer’s instincts (and I am becoming better at this each day). Gardner’s greatest ability is to take a difficult topic and express clearly the problem and the solution (many other writer’s, in my opinion, have tried to do the same thing but eventually fall short of the success of Gardner’s articulation). Gardner is adamant that one of the first things a writer must learn, besides daily discipline at writing, is “his trustworthiness as a judge of things,” meaning “the writer’s absolute trust (not blind faith) in his own aesthetic judgments and instincts, a trust grounded partly in his intelligence and sensitivity—his ability to perceive and understand the world around him—and partly in his experience as a craftsman” (The Art of Fiction, pgs 8-9). Mastery over the craft is what this experience and trust leads to. Mastery could be left vague, but not in one of Gardner’s books. He explains “mastery” as a writer being able to “get the art of fiction, in all its complexity—the whole tradition and all its technical options—down through the wrinkles and tricky wiring of his brain into his blood” (The Art of Fiction, p 15). One of the great things about Gardner’s advice is that he does not pretend to be omniscient or absolute (but often he comes close). He leaves the writer to judge for himself what is good fiction and what is not; after all, beauty takes several forms for different people. Closing out the chapter, Gardner writes, “Whatever works is good. [The writer] must develop an eye for what—by his own carefully informed standards—works” (The Art of Fiction, p 16). In regards to the details a writer must select when describing a scene, Gardner assertively claims that “no amount of intellectual study can determine for the writer what details he should include. If the description is to be effective, he must choose his boards, straw, pigeon manure, and ropes, the rhythms of his sentences, his angle of vision, by feeling and intuition” (The Art of Fiction, p 37). [The writer] writes by feel, intuitively, imagining the scene vividly and copying down its most significant details, keeping the fictional dream alive, sometimes writing in a thoughtless white heat of “inspiration,” drawing on his unconscious, trusting his instincts, hoping that when he looks back at it later, in cool objectivity, the scene will work (The Art of Fiction, p 69). As for me, when I look back on the parts of my writing that work and do not work, I can immediately spot what is well-written (i.e., vivid and alive) because those parts in the story were written when I was deepest in the moment of seeing the fictive dream before me; the parts of my writing that do not work are often written from the intellectual side of my brain, and the writing fails to capture even my attention. Mastering one’s own skills, feelings, and instincts when it comes to the craft of writing is a powerful and important lesson to begin with learning. As in the universe every atom has an effect, however minuscule, on every other atom, so that to pinch the fabric of Time and Space at any point is to shake the whole length and breadth of it, so in fiction every element has effect on every other, so that to change a character’s name from Jane to Cynthia is to make the fictional ground shudder under her feet (The Art of Fiction, p 46). Every character is sufficiently vivid and interesting for his function; every scene is just long enough, just rich enough; every metaphor is polished; no symbol stands out crudely from its matrix of events, yet no resonance goes completely unheard, too slyly muffled by the literal. Though we read the work again and again and again, we can never seem to get to the bottom of it (The Art of Fiction, pgs 77-78). Knowing when to trust one’s instincts in order to shape each element in a story is a very difficult task for any writer, but a necessary one nevertheless. The reader must read the book and stand back, holding it out in front of him, and say, “This is a true thing.” Telling the truth, however, has more to do with choosing the right pieces of the puzzle and putting them neatly together to form a true image of the writer’s intent. One could go on and on with praises and insights taken from John Gardner’s craft books (I know I can). I will begin the ending with his words: “Nothing in the world has greater power to enslave than does fiction” (The Art of Fiction, p 87). And this is where I get to where Gardner most influenced me as a writer. Much of what he wrote simply confirmed for me what I already knew and felt and rarely could express as neatly and firmly as he does. But Gardner demands the writer to be more than a sell-out or one who easily stoops to cheap, publishable fiction for the sake of a dollar. He desires the art of fiction and the artists of fiction to be held to higher standards, because he is correct: fiction can enslave or empower readers and the writer must be careful of which aim is to be achieved. And more importantly, there is a tradition in writing fiction that one must remember. The writer is never alone, can never be alone; he belongs to a rich and profound community of all writers before and after him. Gardner writes in On Moral Fiction that “the artist does not extend his tradition by the force of his own personality or talent” (p 167). For the past fifteen years I have believed myself alone as I sit at my desk and type up the handwritten pages into stories and finally into novels, much like Gardner must have felt. What I learned most from Gardner is that writers have a difficult job ahead of them, often filled with obscurity and posthumous publishing (e.g., Emily Dickinson, Stieg Larsson), but what matters most is that we, as writers, remain true to ourselves, we remain true to our art, regardless if we are ever recognized for it. Gardner, John. The Art of Fiction (1984). New York: Vintage Books, 1991. Print. —. On Becoming a Novelist (1983). New York: W.W. Norton & Company, 1999. Print. posts. Keep up the good work! You already know, a lot of individuals are hunting around for this info, you could aid them greatly.